February 25, 2014. It was the day we were told of Everly's diagnosis. A day we will never forget. 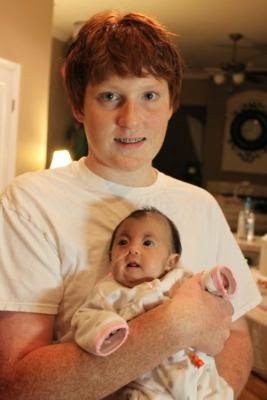 A day we were told that sooner rather than later we would lose the daughter we had grown to love the past nine months. The doctors tried to gently prepare us for this imminent death they were expecting. We wanted to take her home so she could be surrounded by the sounds of our household...noisy boys, barking dog, mom and dad's voices...rather than the incessant beeps in the NICU room. We signed on with hospice, in shock that there even was such a thing for babies. We briefly spoke of wishes for "after" and answered questions about our plans. We were being prepped for the probability of death. But what we were never prepared for when we left the hospital was the possibility of living. No discussions were focused on the how to live with a medically fragile baby. No advice on how to handle the nuances of multiple machines and tanks. No tips on what to expect for development as she aged. No guidance was given for how to navigate this unchartered territory. What could we do and what couldn't we do. 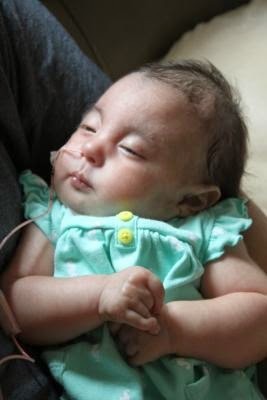 The hope of Everly being able to defy the odds was certainly our prayer but most certainly not in the minds of most of the medical community. So, here we are 102 days later and our baby girl is thriving and so is our family. Every member of the family, including our furbaby, make tracks to see sweet pea the minute I wake her up. They seek her out even before the bathroom. Really. She is so incredibly loved by not only our family but our friends, extended family and by so many who haven't even met her but have just heard her story. We are so encouraged by the messages of hope and faith we receive. She may be little but she's making such a difference all around her! How proud we are of this tiny miracle! Playtime for all three kiddos! We are asked quite a bit "How is Everly doing?" and I post frequently on Facebook pictures of her happy and enjoying herself. I, thankfully, am able to answer that she's doing "well." And thankful we are. But we do not have our heads in the sand and we know that in a split second it could change. Even the "well" is relative to her condition and her specific physical ailments. I make this point so that we can avoid any confusion that her "well" doesn't change her diagnosis. Her therapy will not completely change her clenched hands or that she will be able to ditch the obnoxious NG tube and fully feed via a bottle. Hopefully, it will help, will lesson the tightness in her joint contractures in her hands but won't remove that characteristic of a Trisomy 18 baby. The feed therapy will help hopefully with non-nutritive sucking if successful and possibly any oral aversions when baby food can be introduced assuming she can swallow it. Her "well" means that her pulmonary hypertension is still being offset by the massive VSD (Ventricular Septal Defect=hole) in her heart; either of which without the other would have devastating effects on her body. As she ages, that balance is expected to change. Her "well" means that her numerous daily choking spells haven't increased and are being managed by her own alertness, strong gag reflex and oxygen "blow-bys" we give her. Her "well" means that her desats at night aren't resulting in her turning dusky or needing to be bagged again. Her "well" can be read in so many ways but for her and for us, it means that we are still able to enjoy the privilege of being her parents. Little Everly getting a foot massage and listening to Papa tell her how pretty she is. It really is a confusing dynamic...the probability of dying and the possibility of living. We want to put the first thought out of our minds when things are smooth and seemingly okay with her. However, the reality is that we must be prepared (can you be??) because her body is just not working the way a body needs to and at some point it will be too much. Maybe not this month, maybe not this year and maybe not in five years, but eventually. While that is true for all of us, we know that she will be called home sooner than should be expected for a child. But, again, in the meantime we are trying to live day to day with what we have at the moment. We are now thinking further out than we did before. We are now trying to make some plans the near future. We are doing what we can to have a normal (is this even possible?) life with our three children. SOFT (Support Organization For Trisomy 18) just updated their book entitled "Care of the Infant and Child with Trisomy 18 and Trisomy 13" for 2014. It contains valuable information for parents of children with these conditions and is a great go-to source for us. As I read it a few days ago, I was struck by a few statistics. As one can surmise, I've done my fair share of reading on this subject over the past three months as most Trisomy parents do. However, a new piece of information was given that was new to me. Before I give that info, let me recap some numbers and facts regarding Trisomy 18 babies taken from the SOFT website. Feel free to visit trisomy.org for more information or the Trisomy Foundation. Trisomy 18 is a chromosomal disorder that occurs in 1 out of every 7,000 live births. Previously that number was 1 out of every 6,000 but more families are choosing to terminate upon hearing the diagnosis. With this diagnosis, babies are more likely to have a number of other birth defects and a shorter life span as well as profound physical and mental delays.Testing can be done in high risk pregnancies by using the Maternity 21 or Harmony screen which looks for the three Trisomy conditions (13, 18 & 21). I did take this test at 10 weeks and it was found to be negative. Ongoing treatment, support and care for babies with T18 is lifelong. 50% of babies with T18 will not survive to birth. Out of those that do, most pass between hours and a week after birth.Only 5-8% of babies with T18 will live to see their first birthday.90% of babies with T18 are born with Full Trisomy which means the extra chromosome is present on all the cells in their body. Those with partial or mosaic only have the extra chromosomes on some cells; therefore the prognosis varies (better typically) for them and their lifespan. 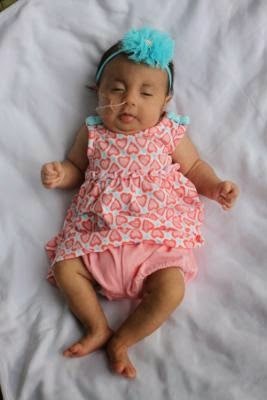 Everly has Full Trisomy 18.The one number that was most shocking to me and was also new information is that there are only around 200 babies who are currently living past their first birthday in the United States currently. Wow! That just took my breath away. I know that Trisomy 18 is rare but certainly expected the number to be so much higher than that. I will continue to be thankful for each day we are blessed with and be joyful for that time. Nana rocked baby girl to sleep. As we are approaching 3 1/2 months with Everly, we are trying to see ahead as we walk the path of her living and not dying. There are no guarantees. There are no promises of tomorrow. For any of us. We only know that she is with us today and while we don't know what the future holds, we do know that living like she's dying isn't helpful to anyone, especially her. We will continue to plan for the future. Continue to look forward and upward for only God knows the plans He has for her. We are only her earthly parents and will do everything we can to give her the very best life possible, regardless of how abbreviated her stay. 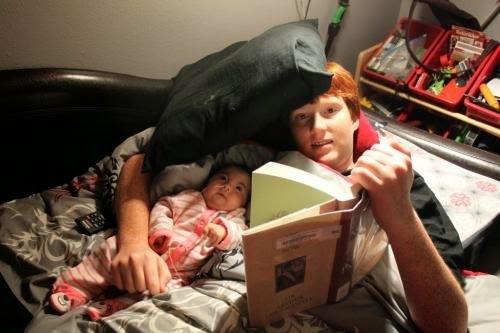 Biggest brother getting some snuggles from sister while doing his reading. Don't forget to check out her Facebook page for frequent quick updates and pictures at Love For Everly! Smooth Sailing at 3 Months! This one's for Ari! Sorry I haven't been posting any pics of me with baby...I'm usually taking the pictures! Thanks for the reminder to put myself in them, too, Ari. Well, we just hit another milestone with little sister...3 months! That's right...92 glorious, love-filled days with this precious miracle! It is almost still unbelievable in a sense that I sit here typing this because as I know I've said many times already, there was no expectation that we would be loving on her all these days, weeks and months after she was born. 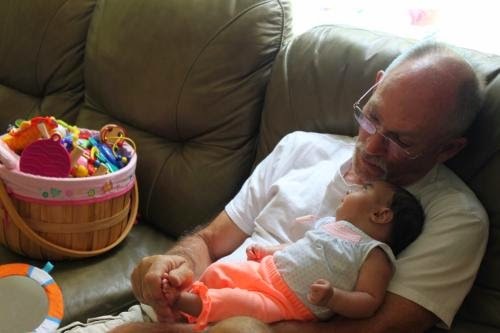 Being sent home from the NICU to offer "love and comfort at home" doesn't necessarily give you hope for an extended future. However, I have trust in God's sovereign plan and though we don't know when He will call her back to her heavenly home, we remain grateful for each moment we are blessed with this baby girl. Things are smooth sailing for us right now and we just couldn't be more content. She continues to be in "good" health...gaining weight on a nice steady curve, keeping safe from yucky germs, and working hard to strengthen her muscle tone. Our last cardiology appointment a couple of weeks ago showed no change in her heart or pulmonary hypertension. This continues to be a blessing because the PH offsets the effects of the large VSD (hole in her heart). Without either one, things would not be going as well. She also saw Dr. Graham, our pediatrician, this week and got a good report from her as well. Weight increase is overall sufficient for her needs and is growing longer as well...20 3/4 inches up from 17 inches at birth! We'll head back in a month for another check up to both doctors. 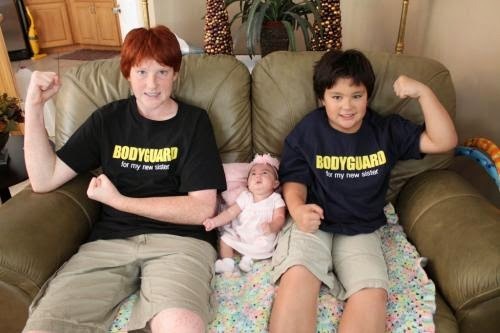 Everly and her bodyguards...determined to provide and protect! She also had a GI doctor appointment a couple of weeks ago to discuss her feeds and a possible GTube surgery. We were very intent on doing the surgery based on all the pros that it would offer Everly. However, when we met with our cardiologist, she gave us the downside. As much as we would like to look at Everly and say that she looks like any other baby, the harsh reality is that she is not. 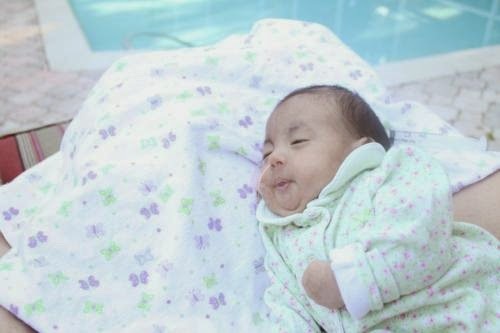 In relation to this procedure, it presents rather severe risks for a baby with Trisomy 18. We were actually under the impression that it was a simple endoscopic procedure, overnight stay and then home. Unfortunately, that does not appear to be the case with her. It would require intubation which makes us nervous because it is entirely possible she would not be able to be extubated after surgery. Second, the stay is closer to a week and certainly not overnight. It would require a special cardio anesthesiologist and would be done in a separate area where higher risk procedures are done. Not that the last reason is completely awful but it certainly raises concern for us. All this to say, that we have at this point opted to hold off on the procedure and revisit it at a later time. Since the NG tube was inserted about a month and a half ago, she's only pulled it out twice which isn't too bad the GI told us. I wish we could snap our fingers and have the surgery done and over. But we'll reexamine as she gets older or if we encounter problems with the NG tube. Everly's at-home interventionist, Mary Ann, on the first day of sessions! Love her! So, believe it or not, we are still in newborn clothes and diapers! Boy, if I had known that, I would have stocked up on the newborn sizes months ago. Since we've worn and reworn and then reworn again all her clothes, my mom just "sacrificed" and went shopping online for some fresh NB sized clothes. I can't wait to get them because they are so incredibly cute! As if she needs an outfit to make her cute, right?? However, there are some new dresses coming with new colors, new patterns, new designs. Oh, so exciting! AND, mom ordered the most adorable new swimsuit for Everly and is going to make her look even more scrumptious! I'll be posting some of her new things as soon as I get them in my hands for sure! Poor Everly may be have to give up physical therapy for a day to model outfits...haha! Mommy's friend, Gwynn, came to visit and posed with Everly and next to the rag quilt she made for our sweet baby before she was born. She even brought a gorgeous monogrammed and embroidered onesie with matching ruffled bloomers! The boys (and I) are so lucky to have some friends who have either invited them over for some playdates (or "hang outs" as my 15 year old insists I say instead) or have taken them on outings. How fantastic is that? Thankfully, the boys are well-behaved and respectful so hopefully that makes the extra company all the more pleasant. It has been a relief to know the kiddos get some fun days out! So, here's a shout out to our friends!! Love you guys! We as a family are still doing P90X3 every day; although Kendan and my dad get their exercise in the pool instead, poor guys. It's tough but we are each getting stronger daily. It is a perfect stress reliever and hopefully is setting a good model for the boys. We actually really like the program and while we must modify the modifications, it's still worth it! Hoping for some "after" pictures at some point, too! I'll keep you posted. Tomorrow we plan to make a big trip out to Ft. Desoto for some fishing and beach fun with my parents. Mom and I plan to chill on the beach with sweet pea while the "men folk" take some kayaks out and fish in the freshwater. While it will be a fair amount of planning and work to get there, it should prove to be a fun-filled day and worth the effort! We are all looking forward to the day! Oh, by the way, we are still adding and checking things off Everly's bucket list. Fishing was one of them and while we went to a local fishing hole last Sunday evening, this will be her first official fishing excursion. Her list is so numerous and continues to change as the days go by. It's fun to see all the experiences, some big and some small that she gets to have. Nany with her gifts she made for Everly and given to her during the visit. Speaking of...this past week she was visited by her Nany from Kansas. She had a good time being snuggled and talked to by her while she was with us. 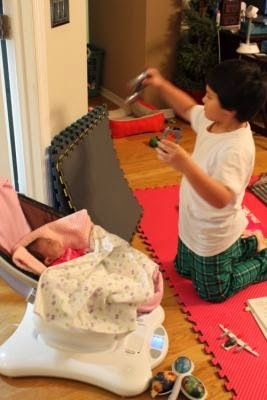 Nany helped put her to sleep, bathed her and even changed her. 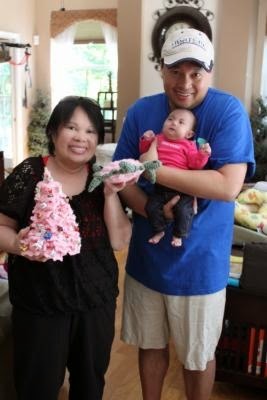 Everly's grandmother even made her a turtle and a Christmas tree both adorned in pink! Thanks, Nany! So, I must confess that I am breaking every "mom" rule in the book on a daily basis with Everly. With five of us in the house on any given day, Everly's body rarely touches a flat surface except for therapy time. Yes, she does nap in my arms a majority of the time. She is so melancholy that she rarely fusses about anything. She definitely does not like to be moved around more than a couple of times, though, and really dislikes being taken from the bathtub. Other than that, she's as cool as a cucumber. She also has taken a sincere interest in staring into our eyes and at our faces. If you have never been stared at intently by a baby or it's been a while, it is certainly a special experience. Our rule here is never to break her stare. Smile back at her for as long as she keeps her gaze upon you. She is studying every feature, every detail of your face. She scans your eyes for the longest time before allowing her glance to flow over the remainder of your face. When she hadn't seen Papa in a few days, she scanned him for a good while when she first saw him again. And just today, we were blessed by a visit from my friend, Gwynn, who taught me how to sew all the essentials in her room. When she cradled Everly, she spent a good 10 minutes studying her because it was a new face, new voice. That baby is truly remarkable! She began her work with Mary Ann, our neighbor and her Interventionist, last week! Yeah! It is so much fun for me to watch someone else work with Everly. 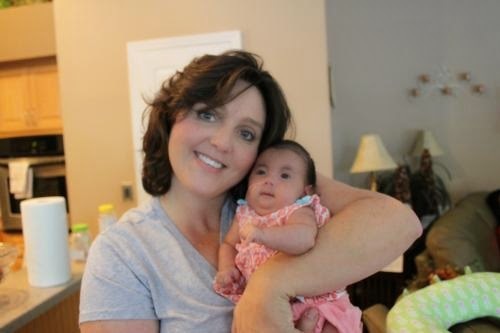 Mary Ann is working with Everly on much the same thing as the therapist is...developing upper body strength, opening her fingers, holding her head up, etc. She is also great because I can ask her tons of questions (poor Mary Ann!!!) and due to her training and experience, she's got the answers! Plus, she comes to our house so it's one less trip out we need to make a week. That brings me to my final thought for today. There is NOTHING incompatible with life about her or any other baby I know with T18. She communicates with us, enjoys things, dislikes other things and is thriving in her environment. She is a miracle and a blessing from God. God did not make a mistake. She was created exactly as He intended and how lucky are we that we get to raise her? I know that the more awareness that is raised by babies who are LIVING with Trisomy 18, the better the future will be for other babies to come. Please help us to share the fact that having this diagnosis, as life-threatening and life-limiting as it may be, is not reason to throw your hands up and give up on these sweet, precious children. They are compatible with life, joy and happiness! Please share her website and her Facebook page. 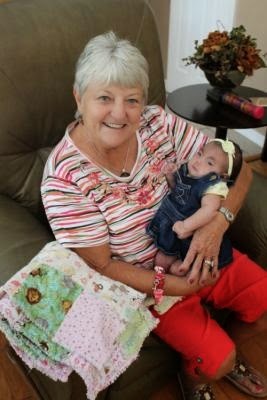 I would like to extend my sympathy to the Adams family of Jacksonville, FL who lost their sweet Elizabeth Joy recently. She was so loved and so well-cared for by her family. Her presence will be missed but her memories remembered. Enjoy your new home with Jesus, baby girl. Everly's friend, Elisabeth Maxine (sorry for my incorrect spelling last time on her name) is growing and is now six weeks old! Her family is grateful still be holding their baby girl and making the most of every minute with her. Her brothers dote on her and spend quality time with her daily. Continued prayers for her good health please. She has a Caring Bridge site as well. Our other friend, Melanie Rachel, is still in the hospital and is recovering from a serious surgery. She is looking good and even had a smile on her cherub face the other day! 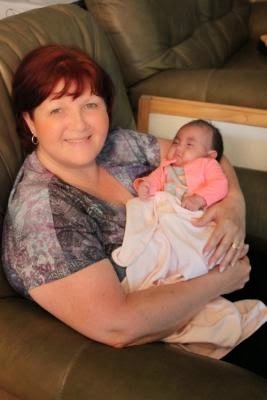 I know her mama was so touched when she finally got to hold her again! Please continue to pray for Melanie's recovery. We are blessed to be a part of a new Trisomy family via Facebook and have met many new baby friends. Please keep these new friends in your prayers as well. Okay, for my prayer warriors out there...our specific prayer requests right now are that Everly will continue to remain in good health and free from yucky germs that may cause her illness which would be serious for her. Please pray that she does not aspirate on milk or saliva which could cause pneumonia...bad all around. Thank you all! Also, we really, truly and honestly love hearing from everyone. If you have time and can leave a guestbook entry, a Facebook message, an email, a text, please do and thank you! I might not be able to respond but it is so special for us (even the boys read them!) to have encouragement. We read and read all the messages. I have saved all emails I've received since before even her birth and go through them when I feel less than positive about our situation. Please know how valuable your messages are to us!! By the way, still working (or rather starting) on getting my thank you notes out. I promise it'll get done!!! I've attached some favorite recent photos and even a video where we captured Everly responding to her name! She's so amazing this little girl! Listening very intently to her Nana singing to her. Since we are still following the advice of our doctors in keeping Everly away from indoor spaces and large crowds, many of you haven't had a chance to get to know her personality as of yet. Still others are a distance away and aren't able to meet her. So I thought I would take this journal entry to give you an insiders view of her personality, complete with a video clip. She is the cutest thing I've ever laid eyes on. I can hardly wait to wake her in the morning. The way she stretches and scrunches her whole body when I lift her from her bassinet. The way she opens her little eyes and focuses on me just melts my heart. I love to nuzzle her cheeks and her chubby neck. Her big eyes look at me when I bend down to kiss her and it just makes me smile. Some mornings she will just rest in your arms and stare at you as if she's memorizing your face. She is in deep concentration and you don't want to break the stare. It's so special! I can't get enough of her! She has become so expressive in the last few weeks. She is starting to make little sounds. 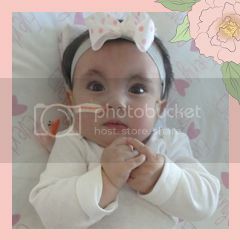 We've also begun to notice that her face changes depending on the activity or even how interested she is in something. She has the faintest smile on sometimes when we are singing play songs with her. That is the newest thing and it has been so fantastic to see her change. I love to count to three before we start a song to give her "heads up" and maybe teach her a cue of what is coming. Just today we got lucky (well phooey on that...God blessed us) with capturing it on video!! I'm going to try to get it uploaded at the end of this entry. I gasped out loud when I saw the little corner of her mouth move upwards. It was a magical moment! She has taken a great interest in her toys and surroundings the last couple of weeks as well. We are working on tracking with toys and helping her to turn her head and follow them left and right. She waves her arms and moves her legs while having playtime on the floor. This is great for her physical development so it's thrilling to see. She has favorite toys that clearly prefers because she focuses on them for great periods of time, like her cow, a pink dog and a baby doll (thanks Melissa, Sandy, and Susie!). She is so much fun! She is a curious being and loves to be carried around to check out her surroundings, too. One of her absolute favorite things currently are lights. Flashlights, fan lights, ceiling lights and now we have her two projector lights. One I bought with ocean waves and one we were gifted (thanks Cindy!) with stars. She can fall asleep just staring at them. She is a very happy and easy baby. She rarely cries and the times she does we can predict because we know what she doesn't like. For example, you can put money on the fact that she will cry when you take her out of the tub. She is wrapped snug in a thick towel the second she leaves the water but she will cry anyway. She goes with the flow typically and seems to be content with most things. We have become very comfortable with her after twelve weeks. A couple of weeks ago, we decided to remove her from constant monitoring with the pulse ox machine. The beeps were stressful and we know her well enough to see when she needs oxygen or stimulation. She does still have the monitoring in the car, during naps when she's not closely attended and throughout the night, though. We have enjoyed the flexibility we all have without the machine so much more. She can be moved throughout the house with ease, can be lifted without setting off the sensors and does not have the cords attached 24/7 now. We are all breathing a sigh of relief! Everly swimming in her tub at the pool. Look at her cute swimsuit! As the mommy of a special needs baby, I am seeing how little milestones like smiling or recognizing faces are huge! 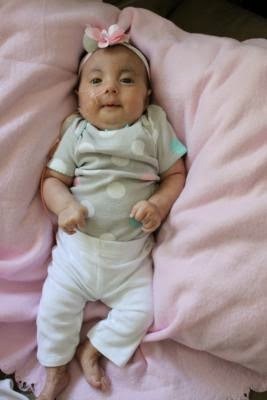 Everly because of her Trisomy is cognitively and physically severely delayed so to see this progress is so exciting! The little things I know we as parents with healthy children take for granted...first smiles, recognizing family, holding her head up, giggles. But it makes those moments all the more special when they happen because for us since they aren't guaranteed to happen. So, it's like a Christmas present when they occur! We continue to be amazed every day as she thrives and defies the odds so very clearly set for babies with Trisomy 18. We are just in awe of this little girl! Please continue to share her Facebook page Love For Everly and her website to spread awareness about Trisomy 18. Let's help the medical community see that their research is not everything! Morning time on the back patio. Love her! Since my last post, Everly has stayed pretty much on a steady course. She continues to grow and gain weight. She enjoys the therapy exercises we do together. And thankfully, she has not had any more illnesses since her pneumonia at 3 1/2 weeks. She is currently just tipping the scale at 7 lbs 3 oz and is eleven weeks today. She's celebrating day number 78 today! I have gotten into a daily habit of feeding her on the back patio for her first meal of the day at 8:00 a.m. The birds are singing, the weather is pleasant and I can have some quiet time with Kendan as well. It's just the three of us up at that hour so it's a good time for bonding. Kendan and I have enjoyed listening to all the various birds flocking to our trees and backyard, and we've actually gotten to hear woodpeckers on most mornings. Everly is awake for part of it but the lull of the bird songs is just too calming for her and she dozes soon after. Next to actually waking her up every morning, this would be my next favorite time of the day. Morning time on the back patio with my two youngest loves. Love spending time with Kendan and Everly first thing in the morning. Our days are a jumble of repetitive activity...feed, pump, school, repeat and repeat. Only the school part tapers off at a certain point each day but the rest continues. Due to her reflux and partly her NG tube acting like a wick, we have to feed her slowly every three hours so to keep the reflux to a minimum. She eats at 8, 11, 2, 5 and on and on. Each feed takes about an hour and 15 minutes from start to finish. She is fed via a syringe by hand during the day because we use breastmilk and the feeding pump wastes too much when you have to prime it to get the milk through the tube. So after the feeding process, I pump and then there's about an hour in between the cycle repeating. Again and again and again. I'm so thankful when my parents can come over to take one of the feedings over or when Jimmy can do one because that frees up a bit more time. Like all mothers, I've learned the fine art of balancing feeding her while simultaneously reviewing the latest vocabulary words with one of the boys. In the hour in between feedings and pumpings, I do the one on one lessons with the boys during the day and in the evening try to squeeze in my P90X3, laundry, dinner, straightening up, her evening walk, family time and such. It is an arduous schedule and uninterrupted sleep is a thing of the past. To ensure her growth, the three hour feed schedule is around the clock and will remain so. It is well worth every lost moment of sleep when we see her weight gain on the scale, though! 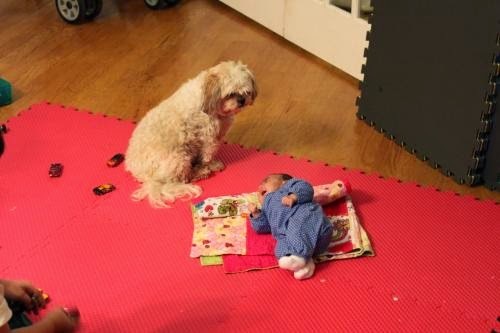 Ala...aka Guard Dog Extraordinaire...standing watch over her baby. So sweet! Love that dog! Those hours not being spent feeding are important in our house. Those are the times when we get to enjoy her and shower her with lavish attention. 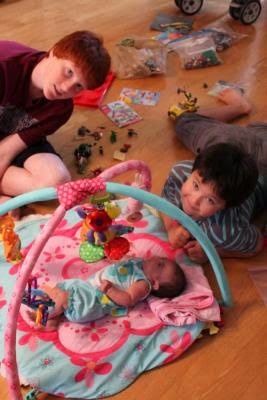 Garren loves to carry her around the house while Kendan loves to get right down with her on the playmat and read to her. My dad loves to also carry her around or rub her hands and talk to her. My mom enjoys playing piggy toes with her and talking to her about God. Jimmy is the night rocker and patiently plays the sandman role. I personally like doing her therapy exercises when she's awake. And Ala, well, she just enjoys her role as guard dog-mama, a role she has now perfected. Kendan entertaining Everly with an airplane show. He was so sweet that he even asked me if it would be okay for him to do it. I told him I thought Everly would LOVE it and she did! We have no real typical day here, though, because of scattered doctor appointments, hospice nurse visits to the house and therapy sessions. Each day and each outing must be planned out in advance to make sure we have her milk heated and packed in a thermos, my pumping necessities in case I need to express in the van depending on how long we are gone and all her supplies for each feeding and of course, her pulse ox machine and oxygen tank. So, there is no spur of the moment hop in the car to head out somewhere with the amount of preplanning it takes to head out. Speaking of feeding, prior to our current experiences, I would have had no idea how a tube fed baby is actually fed. So, for the benefit of anyone like myself 78 days ago, let me explain. We must use a stethoscope to listen to her stomach at the same time you push a small amount of air through a syringe into her tube. This ensures you are feeding her directly into her stomach. If you're not careful, the milk could end up in her lungs which would be deadly. This procedure must be done before each and every feed. Once we've ensured correct tube placement, even though we don't actually move the tube, we then check for any residual milk from the last feeding. If it's too much, we must alter the current feed so as to not overload her tummy. Then we must fortify her milk with extra calories from formula to help her gain weight so that is added to her milk. From there we heat up her milk and using the syringe the milk is slowly pushed through her tube. To help with reflux as I mentioned earlier, we must do this extremely slowly; therefore, this process is about an hour and fifteen minutes long. I just wanted to explain this because unfortunately this process coupled with my need to pump certainly hinders my and our ability to be out and away from the house for any length of time. Our family trips to the beach literally took serious planning and coordination. It is a real effort to get out of the house but the reward of being able to visit friends or just get out of the house is so worth it! (FYI: Doctor's visits do NOT count as an "outing" as it pertains to enjoyment or time away...as much as I do love our doctors.) I do try to keep visits or excursions (ie. hiking) close to home so that most of the time is spent visiting with friends or the actual activity and not on the road which in and of itself is stressful with a beeping pulse ox machine. Hope that helps explain why I need to stay as close to home as possible! On another note and something that has been on my mind and heart as of late is my business life. One of the things that has changed the most in the last eleven weeks, besides, of course, having an adorable baby to snuggle and love, involves my professional pursuits. For the past twenty years, I have tutored students year-round only taking a week here or there for a trip or two weeks after Kendan's birth 7 1/2 years ago. In addition, I have provided standardized testing and portfolio evaluations for fellow homeschoolers for years. I also was a leader in our cherished homeschool group and was a teacher in our co-op. However, in light of Everly's needs, I had to make the emotional decision that I would not able to continue with any of these roles at this time. That absence has created a large void for me as it was something that defined me outside of my role as mom. I do know my calling now is to devote myself to Everly and the boys and continue to homeschool and the two combined is a full time job but it doesn't make the loss of my professional status less difficult. I love what I do professionally and my homeschool involvement and take great pride in my work so to not have it is hard. So, to all of my clients (really my friends!) in any capacity, I realize you have already heard this announcement but please know that I miss working with you and your children. And to all my homeschool friends, please know that I miss my time with you and your families. I miss attending Monday co-op, teaching classes and planning activities for SHINE. I thank you for your understanding that at this time my focus must be centered on my children and doing what is best for the family. There will be a time when it is right for me to return to what I love but for now know that I wish you the best! I would be remiss if I did not end this post with mentioning how insanely grateful we are for every day we have our sweet pea. We are thankful for that time we have feeding her...thankful for baths we get to give her...thankful for the walks we get to take her on...thankful for the diapers we change...thankful for the faint cries she makes...thankful for each facial expression she makes...just thankful for the time we are spending with her and how much we are getting to know her personality. No sacrifice is too big for this time we have with her nor will it EVER be. To wake her each morning and know that it is yet one more precious day we have to hold and love her is priceless! We know that we have been given a gift and we pray that we are mindful on a daily basis to honor it. P.S. Everly has made some new friends and we would like to encourage everyone to include them in prayers. Melanie is a sweet baby girl from Orlando who is currently in the hospital recovering from a procedure she had done a couple of weeks ago. 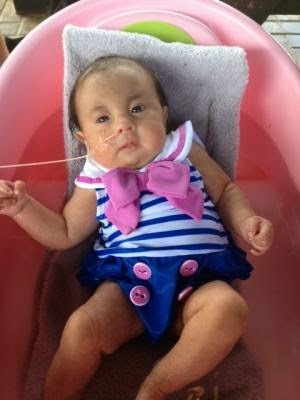 Elisabeth is an almost one month old adorable baby girl from Texas who is rocking the Trisomy thing. Thanks! One more thing...I have been running through all the thank yous I need to send out in my head for weeks now and have been working on finding the time to sit and work on them. Please know that we are thankful beyond words for all the meals, gift cards, donations, gifts, cards, notes and messages we have received over the past almost three months. It is VERY uncharacteristic of me to not be prompt with thank you notes and I believe I'm breaking out into hives just from the mere fact that the cards aren't done yet. LOL However, I wanted you all to know that I am getting there slowly but surely and that I have been keeping track but free time to write them out like I want hasn't presented itself yet. I'm confident at some point it WILL happen. In the meantime, please accept our thanks for your generosity.